ANIL Kumar Chaudhary has been appointed as the new chairman of the Steel Authority of India (SAIL), a government order said on September 21. ACC also deputed PK Rath as CMD of the Rashtriya Ispat Nigam Limited (RINL). He has been serving as the Director (operations) in the same company, the second largest steel-making firm in the public sector. The ACC also appointed V Gopi Suresh Kumar as Director (Projects) in RITES Limited, a railway consultancy firm. Currently, Kumar is serving as the executive director in the EPIL. Prior to this, he was working as Executive Director Finance & Administration (F&A) at SAIL's Bokaro Steel Plant till August 31, 2011. He previously worked as General Manager (F&A) at SAIL Corporate Office, New Delhi. 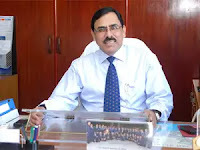 With Chaudhary's appointment pending, the ACC had assigned additional charge of the post of Chairman & Managing Director, SAIL to Saraswati Prasad, Special Secretary & Financial Adviser, Ministry of Steel, following the superannuation of previous chairman Prakash Kumar Singh on June 30, 2018. Chaudhary has been holding the charge of director finance at SAIL since September 2011. Prior to this, he was working as Executive Director, Finance & Administration (F&A) at SAIL's Bokaro Steel Plant. Earlier, the country's top head hunter Public Enterprises Selection Board (PESB) had recommended Chaudhary for the top job at SAIL in March this year. Besides him, other candidates who were interviewed by the PESB were MOIL Director Tanmaya Kumar Pattnaik, SAIL Executive Director Alok Alok Sahay, SAIL Director (Commercial) Soma Mondal and Central Electronics Ltd Chairman and Managing Director Nalin Shinghal. Chaudhary's appointment comes at a time when SAIL, which is nearing completion of its balance Modernization & Expansion Program, managed to trim its losses by around 83% in FY'18 and posted a standalone net loss of Rs 482 crore against a loss of Rs 2,833 crore in FY’17. The consolidated net loss stood at Rs 281 crore for FY’18 as against Rs 2,756 crore in FY’17. SAIL was recently in the news when it sought permission to skip paying dividend to the government of India for the third year in a row row, citing losses suffered by the state-owned company in 2017-18. Besides Chaudhary, other candidates who were interviewed by the public enterprises selection board were MOIL Director Tanmaya Kumar Pattnaik, SAIL Executive Director Alok Sahay, SAIL Director (Commercial) Soma Mondal and Central Electronics Ltd Chairman and Managing Director Nalin Shinghal, PESB said. Chaudhary joined SAIL in 1984 as Junior Manager (F&A). He has accomplished a number of assignments during his career in SAIL. In particular, he has contributed in the areas of treasury and banking operations, foreign exchange management, capital budgeting, cost and operations budget, financial concurrence and administration of centralised gratuity and superannuation funds. Government headhunter late last year had invited applications for the post of SAIL chairman.